This is the end of 8th week of theMarketing with Social Media class with Prof. Bill Belew. This week we have to write two guest post assignment for Prof. Bill Belew. We have discussed about why Content Marketing is better strategy in term of drawing traffic to your website, compare to Social Networking sites. The reason is because, people will read your contents once you press publish and the can be found and read for many years. The traffic coming to your site is endless. Whereas, the effect of social networking is usually short. Another topic is how to improve my performance in blogging. In order words, what make me a better blogger? 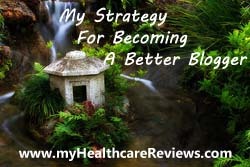 How I can improve my Natural Health Care Reviews site. Basically there are about 5 areas that I think to improve. They are all basic stuffs that Prof. Belew has repeated many time in the classroom. You know, we all easily forget basic but essential point when writing our post. I summarized 5 points that can help me to improve my blogging to next level. 1. Have a compelling title of the post. This is something that I easily forget to make a killing effect titles every time I published my post on my website. It ends up I have to re-edit the title accordingly. 2. Read as many as I can. The more I read, the better quality of post I can write. 3. Try Social Media strategy. I am not quite like socialize online. So I do not quite active in Facebook. If you know me, you will know I don’t quite write something on my Facebook wall or write something on my friends’ neither. 4. Targeted keywords for SEO. I do not consider the targeted keywords in ahead before I write my articles. 5. English grammar. I know English grammar error should not happen and should be in minimum error in the graduate writing class level. But sometimes people do make mistakes.